You may have noticed that it’s been a week since I blogged… sorry! 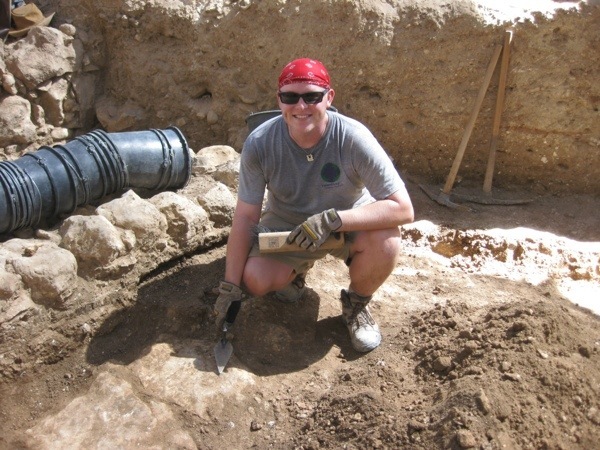 Things have gotten very interesting at the dig, and I have spent any extra time I’ve had journaling (as required for course credit) about the dig rather than blogging for it. The two styles are not all that different, however, and I’ve decided to share my journals (sans sketches and drawings, but with pictures!) from the last two days as a blog post. End of day, Friday: posing in our locus, next to the top step! Before doing so, I should summarize the first few days of this week of digging. Monday and Tuesday were both very tedious days, and it seemed like we spent the entire time in bucket chains. Perhaps this feeling included a little bit of resentment: while the section to our south continued to find beautiful pavement and even small chunks of fresco, our wall seemed to lead to nowhere. 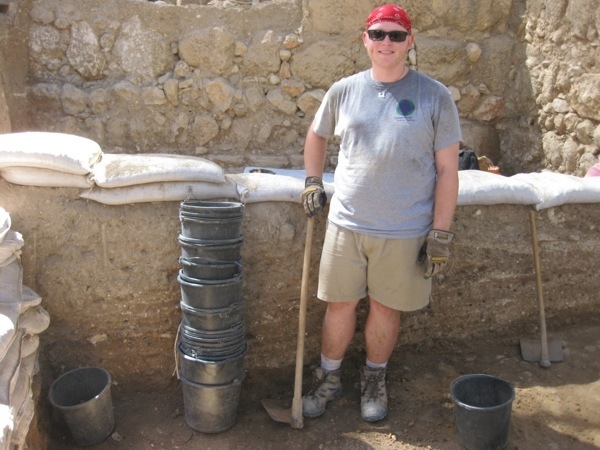 We continued to dig and found nothing of significance. On Wednesday, I had to stay back at the kibbutz and spend the day in the dig office, as is required when taking the dig for course credit. Though this change of pace–I got to sleep in until 6:00 am!–was enjoyable, it was not exciting. I would have preferred to dig, even though I got to help catalogue both the mundane and the interesting finds from the session: some alabaster, an intact juglet, a figurine of some sort, bronze pieces, etc. When my comrades returned to the kibbutz from the dig, however, they brought exciting news: they struck pavement in the southwest corner of our locus! Thus begins my journaling of the eschaton of the dig session. It was an exciting beginning to the day today, as I was itching to see my comrades’ progress within our locus, and specifically, the pavement we struck. 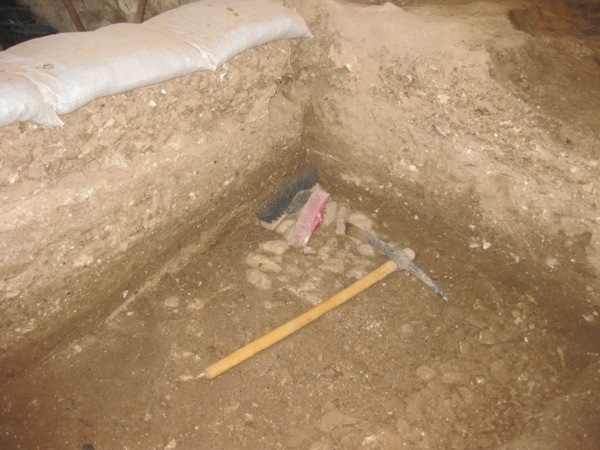 Though it did not look like much in the morning–a square approximately 2 feet by 2 feet had been uncovered in the southwest corner of our locus–the promise was evident. In all likelihood, our entire locus could have the same flooring, if we are able to reach it in time. This is the small section of pavement found in our locus, with some tools scattered about. As we began to dig in the morning, we were noticeably tepid with our picks, so as to not disturb the pavement that lies somewhere below our remaining layer(s) of dirt. Shortly after beginning, however, we were able to determine that digging a “usual” layer of about 5 cm would not fully uncover the pavement. At the south end of our locus, we descended further than the usual 5 cm at first, in order to determine if we could take off the final layer in one fell swoop. But, we decided to follow the usual procedure, and allow the pavement layer to wait until tomorrow, if we are able to reach it. At this point, my attention was turned to the mysterious wall in the northern end of our locus. Following Wednesday’s progress, we started to feel as though there may not, in fact, be more to the wall than was visible. Using a small hand pick, I descended another few inches on the south side of the wall, and even dug a small incision underneath the wall. Our conclusion from this trial was that the wall, though it is interesting, is floating, and does not continue any deeper. Ryan and Shlomit initially asked us to prepare the wall for photographing and removal, but Shlomit then changed her mind, and we returned to working around the wall. Our locus, viewed here from the north, is still very much a work-in-progress as of Thursday morning. The remainder of the day was spent digging, picking and sweeping with my comrades in our locus. In between the several lengthy bucket chains of the day, we successfully descended another full layer 5 cm in depth, setting the stage for the last day of the dig session, when with any luck we will reveal the extent of the pavement in our locus. In the case of Elanij, At, Fanie, Coenie (who joined us for Friday in Timberlani’s absence) and myself, knowing it would be our final day of digging stirred both excitement and inspiration to work fast and effectively. Even though we knew we were just centimeters from striking pavement below us, the essential dig technique did not change much: we were to delicately and methodically remove the next layer of dirt to expose whatever lies underneath. But, since we already had an idea about what we would find, we were especially careful with our picks and scraper/shovels. Here’s our team of hard workers in L12-330, from left to right: Fanie (pronounced “Fonnie”), At (pronounced “Ott”), Elanij (pronounced “Elonay”), and Coenie (pronounced “Coonie”). And me of course, in the back. 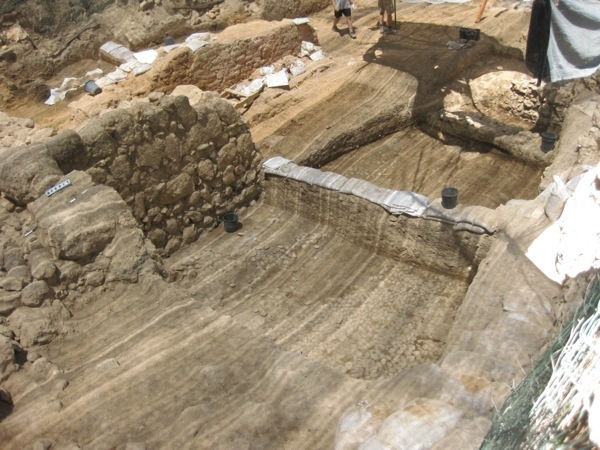 What we found was not far from our expectations: the pavement continues from the south end of our locus northward, meaning that our locus relates to the megalithic wall and everything else in the locus to the south. Unfortunately, though we could plainly see the evidence of the pavement in our locus, Shlomit asked us not to uncover it with picks and fine brushes. Though this was a disappointment, we understood the reasoning: the bulk that separates our locus from that to the south no longer serves a purposes, and, in fact, is a hindrance to understanding the structure’s utility. It will be carefully removed beginning Monday, and its removal and cleaning during next week could irreparably disturb a well brushed and exposed pavement surface. Our minor disappointment soon would subside. As we were working to merely find the uppermost hints of the pavement in the north end of our locus, just to the south of the floating wall, we struck some different stones. These were much larger, very obviously flat, and smooth–as if they had frequently been walked upon. Stones of this variety spanned the locus in a straight line from east to west, and our premonition was that these formed perhaps the top step of a stairway leading to the north, toward the portions of Area M previously excavated. With this, we struck another “Friday Find” that served as a proper conclusion to our three weeks of digging a fill. However, we would soon make another find. Michael John, another South African who had just been moved to the small section of our locus to the north of the floating wall, came upon more stones qualitatively similar to those that formed our top step. Michael John’s stones, and those we uncovered are not on the same plane: ours seem to be higher, suggesting that the “stairway” premonition may have some sound footing. Some steps remain before reaching a formal conclusion, however: next week, the floating wall must be photographed and removed to see what lies below, and further digging to the north of our area could discover what exactly, if anything, this stairway leads to. How’s that for progress? Three weeks ago, the entire height of the buckets to my right was covered in dirt. All that remained after this find was minor brushing and cleaning of our area and one final bucket chain. It is bittersweet that my participation in the dig is coming to a close now. As a team, we dug, quite literally, a few tons of dirt. It is pretty obvious that the area had been a fill, but we were lucky enough to find the first signs of what was filled. 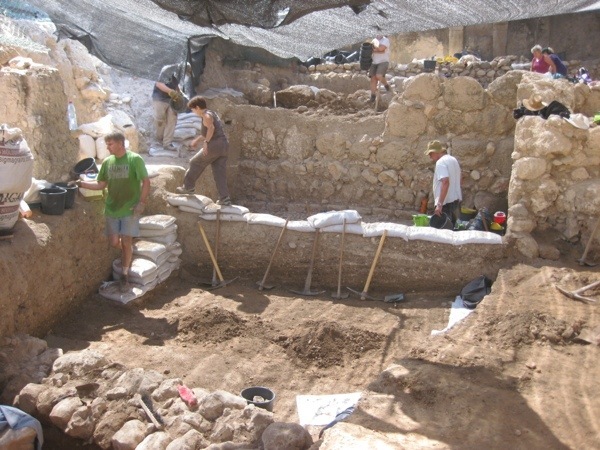 Certainly, more digging will be necessary to allow Shlomit and the other archaeologists to make any firm conclusions about our locus and its relationship to those that neighbor it. But I can be proud of the fact that our team was lucky enough to strike one of the few floors of the session, and not simply more walls. Hopefully, the next team to occupy our section will have as much success as we did, thereby allowing some sense to be made out of these structures’ past glory. A final photo of our locus, and the one to the immediate south. This entire area has sometimes been called a “plaza” and a “pool,” but no one yet knows what it really was. I also decided one final thing on Friday. As I will be staying in Israel for 12 more days following the dig, I will make a trip north from Jerusalem to see the progress before I leave. I told Prof. Ben-Tor, who oversees the area, that I expect to find answers when I return! As I finish this blog post, it is approximately noon on Saturday. I had a restful night at the kibbutz on Friday night, and soon I will shower and pack to head to Jerusalem and begin the next step of my journey around Israel. I haven’t made any major plans yet for the week to come, other than that I won’t start day-tripping around the country again until late next week. Hopefully I will write next from Jerusalem, as I still want to publish a post about our rental car trip to the Jordan, Caesarea, etc. from last weekend. Until next time, thanks again for reading. I did miss reading your updates daily so was happy to see your latest post. I can hardly believe that three wks is over already as well! You did an amazing thing Rob & we are pretty proud of you! Enjoy your next 12 days of adventure & will look forward to more updates. Travel safe!